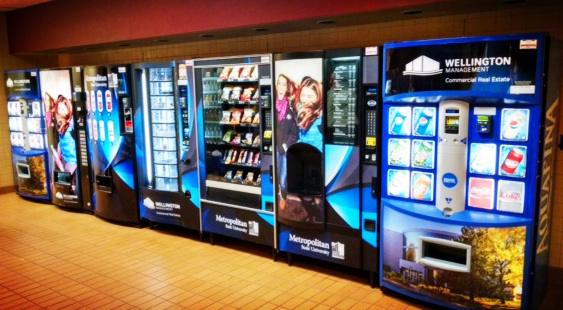 It’s time to redefine your concept of vending services. Taher has taken our years of culinary experience and overhauled the old sugar-filled standard, creating an innovative blend of freshness, nutrition, and convenience. And your company will love the difference. Each morning, your vending machines will be restocked with a full line of hot and cold entrees, freshly prepared daily by our team of professional chefs. Dishes will range from comfort food to healthy, low-fat options, including salads, hot and cold pastas, and sandwiches. In other words, your employees will have a virtual restaurant in their break room, with a complete menu of great-tasting, nutritious meals available to them at the touch of a button. Of course, some days, nothing hits the spot like a mid-morning cappuccino or a mid-afternoon bag of chips. Your employees can choose from a wide assortment of freshly-stocked name-brand snacks and beverages, or brew up a reviving cup of coffee, espresso, cafe latte, cappuccino, hot chocolate, or tea. Most importantly, you’ll find Taher is utterly devoted to making sure your experience is flawless. You’ll always receive prompt, professional service, whenever a need arises; we’re available to you 24 hours a day, seven days a week. Because, after all, a healthy meal should never be more than a button-push away. alternatives to vending in your workplace!